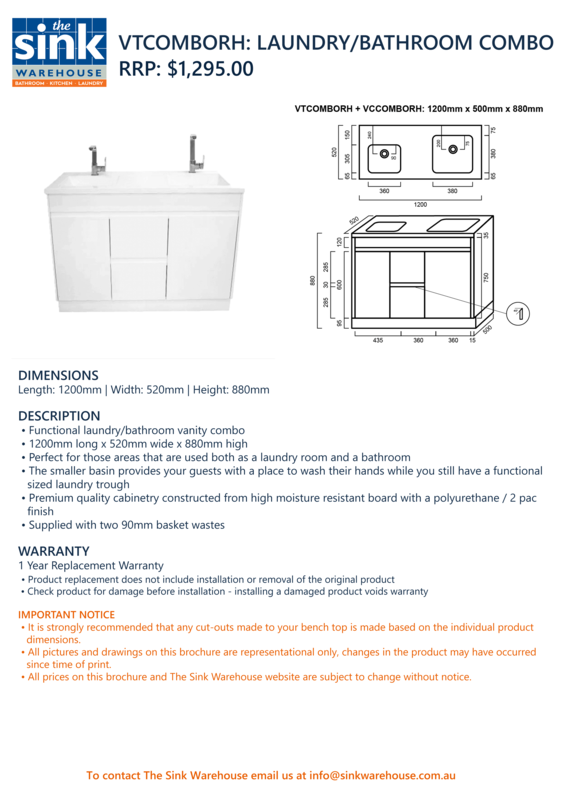 Laundry/Bathroom Combo (Right Hand) | The Sink Warehouse | Shop Now! • It is strongly recommended that any cut-outs made to your bench top is made based on the individual product dimensions. • All pictures and drawings on this brochure are representational only, changes in the product may have occurred since time of print. • All prices on this brochure and The Sink Warehouse website are subject to change without notice. • Handling and delivery can take up to 7-10 business days. • Fees will be calculated at checkout based on region and item weight. • All items can be shipped Australia wide unless explicitly stated in the products description.